An Eco-municipality is a local government – a municipal or county government – that has officially adopted a particular set of sustainability principles and has committed to a systematic, participatory approach for implementing them. We believe that the local level is the more important and efficient in the transition toward a sustainable society. It is the more practical to quickly implement concrete, sustainable and participatory initiatives that benefit the environment, the economy and the human beings of the territory. When was the concept of “Ecomunicipality 5.0” invented ? The first Eco-municipality was created in Övertorneå in 1983 and the whole concept of Eco-municipality was then completely new. By trial and error, we managed to step-by-step define what an Eco-municipality is or should tend to be, and throughout the years, the definition has changed and improved. Instead of reinventing the name Eco-municipality, we chose to stick with its original name and add a version number, in order to show the history of this concept. The current definition emerged from the project Sustainable Robertsfors, which took place in 2007. To become an Eco-municipality suppose to adopt a framework. Here are some of the keywords composing it. 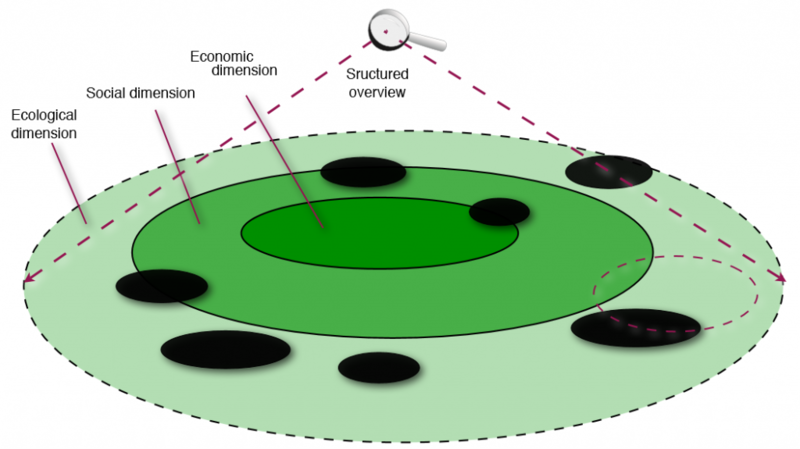 An Ecomunicipality 5.0 is based on a system perspective, which suppose not to deal with problems one by one, but instead to have a more complex and large view on things in order to understand the links between all the elements and to solve problems at their source. This system perspective aims to avoid creating a new problem by solving one and to find more efficient and sustainable solutions. Back-casting – as opposed to forecasting – is a method used in planning long-term projects. Put simply, forecasting predicts the future based on current conjectures and the current state of situation. Back-casting defines a specific goal for the future and from there looks back to the present to see what has to be done in order to reach this final goal. Hence, we often use it to better determine and carefully plan step by step each project in which we’re involved. The idea is to be driven by a vision of the future we really want, and plan and act to achieve it, instead of simply reacting to the situation. Change can only happen if we take our future in our own hands. You can find a more detailed description on the way back-casting works here. In the early 1990’s, 4 system conditions for sustainability were designed in a consensus process among hundreds of especially natural science researchers. 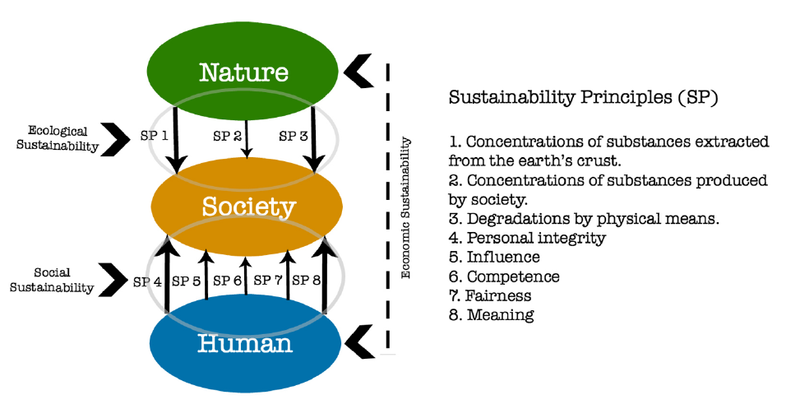 It was later enlarged to 8 Sustainability Principles, divided into two categories : Ecological Sustainability and Social Sustainability. Those principles have been adopted by all the Swedish Eco-municipalities and have proven their efficiency to make a territory sustainable, if kept in mind in every decision. These Principles aren’t used on their own. They are used to link the three circles, that are Nature, Society and Individuals/Humans. We consider that Humans have a relation with Nature, but also one with the society in which they live. Society in turn, is what gathers Humans together and defines their place in Nature. It must be underlined that no municipality can yet be said as a role model in all aspects of Eco-municipality 5.0. They all have their strenghts and weaknesses. But following these principles, they can only become more sustainable. For the transition to Eco-municipality to be efficient and sustainable, all the actors of the local community must be involved. Not only it meets the Social Sustainability principles, but it also ensures the vitality and efficiency and the Eco-municipality process. Indeed, the most successful Eco-municipality projects are the ones that have been able to involve the community (citizens most of all, but also local business, associations, schools, etc.) through participatory and democratic processes, like the Future circles in Övertorneå (study circles created in every village of the Övertorneå municipality in 1983, that soon became more action-oriented). The list (and map) of the 110 Swedish Eco-municipalities can be seen here (in Swedish). A list and map of the 28 Eco-municipalities of Wisconsin (USA) can be seen here. Find more information about the american initiatives here. Find below a map of the eco-municipalities and other similar initiatives in the world. Blue : Swedish eco-municipalities members of SEKOM. Orange : Ethiopian eco-municipalities to become.